Mahabalipuram (or Mamallapuram) is a very popular tourist destination in Chennai, Tamil Nadu. It is situated around 40 KM from Chennai, on the East Coast Road (ECR). You can also reach it via OMR (Old Mahabalipuram Road) as well, but the ECR is preferred as it is the entertainment highway of Chennai and the road runs parallel/close to the sea. If you leave your windows open, you might even get some sea breeze, as you travel! Mahabalipuram is famous for its rock-sculptures and other historical monuments. Most of the monuments here were constructed during the 7th/8th Century CE during the Pallava period. Considering its historical importance, the monuments here have (collectively) been designated as UNESCO world heritage site. This article is to help tourists to identify important places/monuments in Mahabalipuram/Mamallapuram and suggest them the (probable) order in which they could visit the monuments. Also, I have linked each place below to its appropriate blog-post, where I have written about them in detail and published more photos. I hope these things will enable tourists to decide which places they could spend more time/skip. Of course, it is impossible to cover Mahabalipuram, in a single blog post. There are so many more places to visit/so many more things to do. Hence, this article should only be considered as a starting point. From the Mahabalipuram bus-stand (which should come on your right-side as you enter from ECR), if you take the immediate left (just after crossing the bus-stand), you can park your vehicle and go straight to the beach. This is a family beach and will be quite crowded whenever you visit. Some water sports activities are available, I will update this space when I get more details. 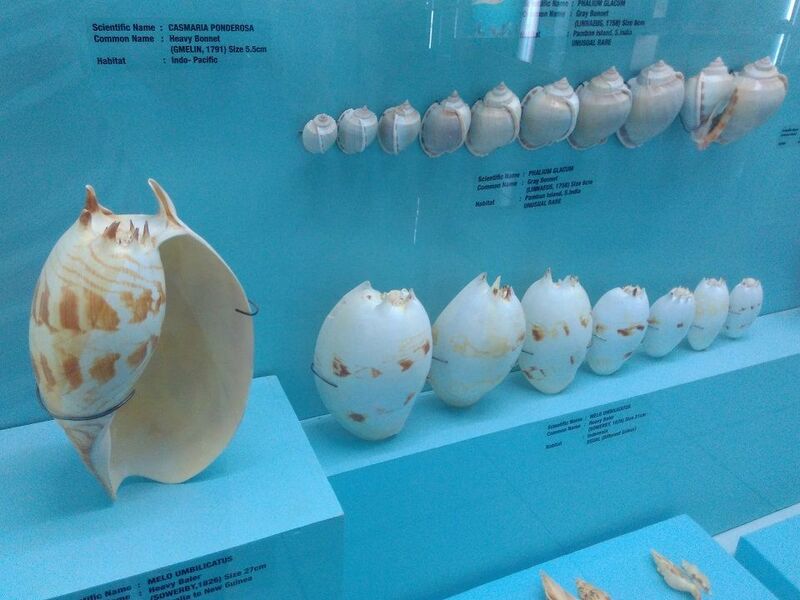 The India Seashell museum hosts an exhaustive collection of seashells collected by one person. I guess there should be more than 10,000 seashells here and there are some objects like car, train, etc. made of seashells. There is also a small aquarium here. Read More..
As I said before, this is a very limited list of the monuments that you need to visit in Mahabalipuram (called Mahabs ‘affectionately’). You should of course, explore and find out more places to visit. I will also try to update this blog post with additional places, from time to time. These monuments are open from morning 6:30 AM to 6:00 PM in the evenings. Try to avoid going on weekends if you want to take pictures of monuments without people in them. If I have missed some place, do let me know in the comments section below. I don’t remember seeing the Rayar Gopuram! This article will be handy when I take our friends and relatives to Mahabalipuram in the future. The details are very good, D.I. i’ve been to this place twice .. reading this post brings back the good old memories ! Thank you Rajesh Sir for this wonderful post! Yeah, my post update frequency is quite high now. I wanted to finish writing them now, otherwise I might stretch it to 3-4 months! Once I am over with this ECR, I’ll come back to the normal blogging frequency. I went to Mahabalipuram when I was a kid and its a beautiful place. I went to most of the places you mentioned but missed going to beach as we already had gone to beach in Chennai. Great post :). There is a lot of crowd in this beach, so it’s good that you avoided it. Most of the time, Marina and Besant Nagar beaches are more quieter. There are so many beaches in ECR that are quieter too, but one needs to be careful while visiting them. It’s not advisable to go to secluded beaches unless its a private beach managed by Taj Fisherman Cove or a popular beach resort, etc. Thank you very much for your very vivid and picturesque posts of this wonderful part of the world which is such a treat to, i believe, every person who admires history, culture, art, architecture and in short – humanity! This place is on my must-visit places.. last time we went here it was pretty late and the temple was closed. Your pics made me realize what I missed. Must visit it sometime. Yes, this place is must visit because this place is quiet, serene, green and doesn’t have the kinda crowd like Mahabalipuram. Delighted that you have dedicated a detailed entry to Mahabs. We have just set up a facebook page for love of Mahabalipuram! Please like and share. We hope to have regular but not overwhelming frequency of posts on there. And let us know if you want to contribute as well and I will provide you admin rights. Hope to see you on there and be in touch! Good to know about the FB page. Mahabalipuram is a small part of what I am doing on this site and I have already completed writing about it here. Thank you destinationinfinity for sharing. Indeed it was useful information about Mahabalipuram. keep up the work, Appreciate the time taken to share the valuable info with the visitors/devotees like us.